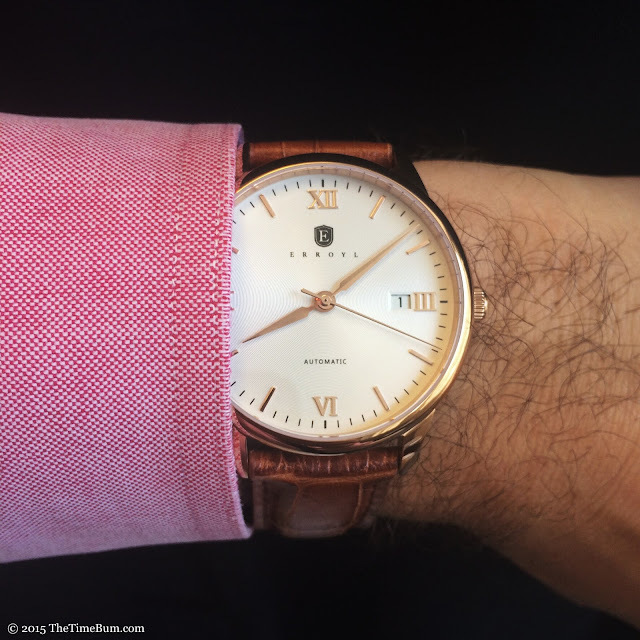 Back in December, Australian newcomer Erroyl launched their E30 Heritage automatic dress watch with what turned out to be a wildly successful Kickstarter campaign. Since then, they have commenced delivery of the original three models and expanded the collection with the Heritage Royal 300, an upgraded limited edition. I liked what I saw in the pre-order information, but nothing compares to a real-life hands-on review. Does the Heritage live up to its hype? They sent me a Heritage Rose Gold ($296.19) and a Royal 300 Limited Edition ($304.36) to find out. 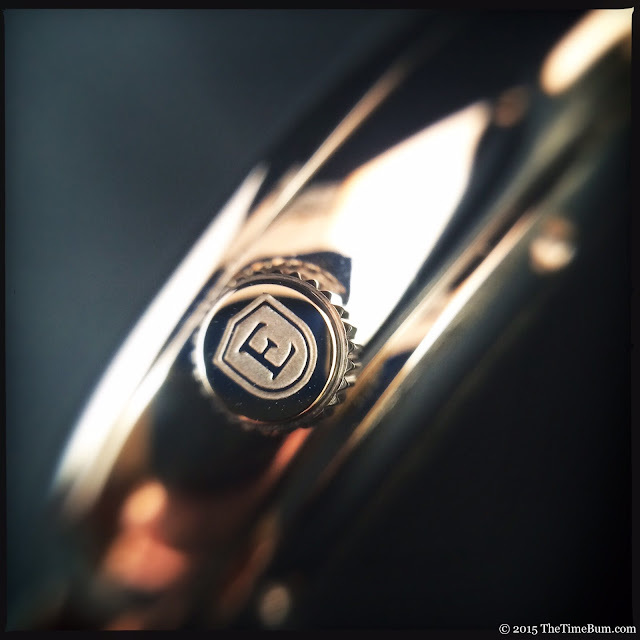 Erroyl describes their watches in terms of refined and affordable elegance, and as I turned the Heritage over in my hand, I was inclined to agree. These watches hit all the right notes. They measure 40mm across and only 10mm thick, placing then squarely in the mid-size range. I personally prefer 38mm or smaller for a dress watch but I suspect the majority of modern watch buyers would disagree. A 40mm case suits a wide range of wrists and is a nice size for everyday wear, so I must concede that it was the right call. Rounded sides and bezel, together with the short, pinched and curved lugs, soften the appearance of the case so it wears slightly smaller. The result is graceful and understated as a dress watch should be. The coin-edged, push-pull crown is a proper size for this case and still easy to grasp. It is signed with an Erroyl logo sufficiently detailed as to make removal of the blue plastic film a bit of a challenge. The dial demonstrates a similarly nuanced touch, bearing a printed index and applied baton markers with Roman numerals at 12, 3, 6, and 9. Dial text is kept to a minimum: the Erroyl shield logo and widely spaced brand name above, the word "Automatic" below. Faceted lance hands complete the picture, lending a touch of old would charm. The date window has a beveled frame and does not crowd or interfere with the 3 o'clock marker, which come to think of it, would have posed a problem had the watch been much smaller. As the dial's surface catches the light, it displays a metallic sheen. Peer closer and you will see it has a fine concentric texture. It is a subtle, yet effective detail that makes the dial that much more satisfying. 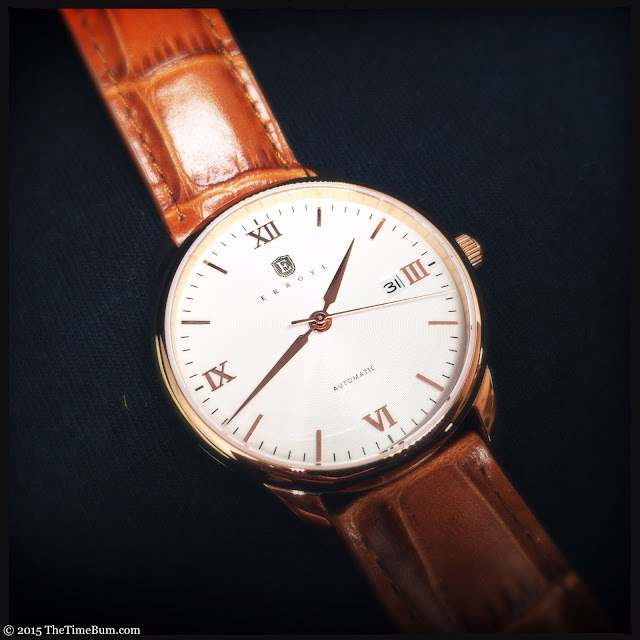 The Rose Gold model has a warm-toned, off-white dial that complements the gold case and markers. The White and Black models have dials in exactly the color you might imagine, but with polished steel cases, markers, and hands. 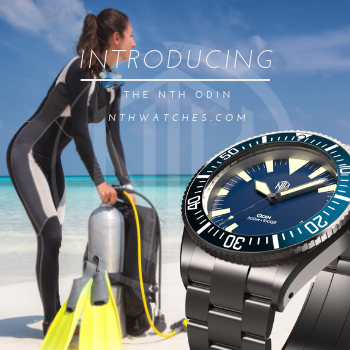 As this is a traditional dress watch, its 50 meter water resistance and absence of luminous material should come as no surprise. At this point, I must introduce the Royal 300 as it diverges from the standard Heritage. 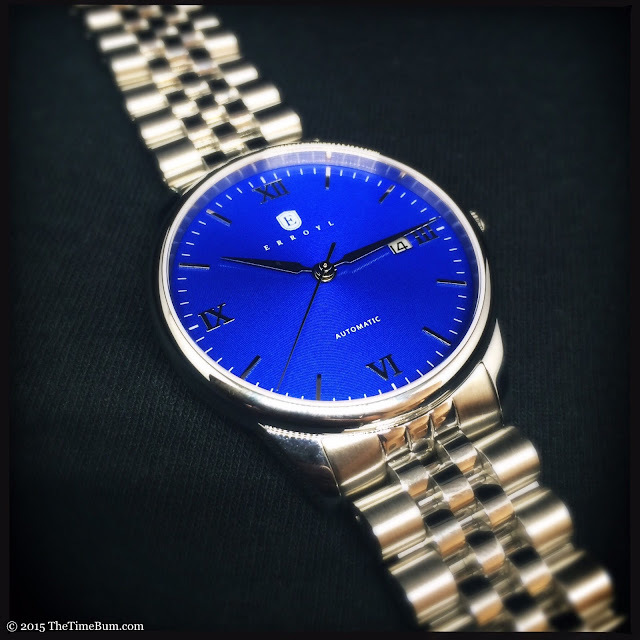 It shares the same case and layout but features a stunning blue dial. It is more of a practical, all-around watch, trading the crocodile print leather and signed deployant clasp of the standard Heritage for a semi-rounded link, brushed and polished jubilee style bracelet, on its own deployant. 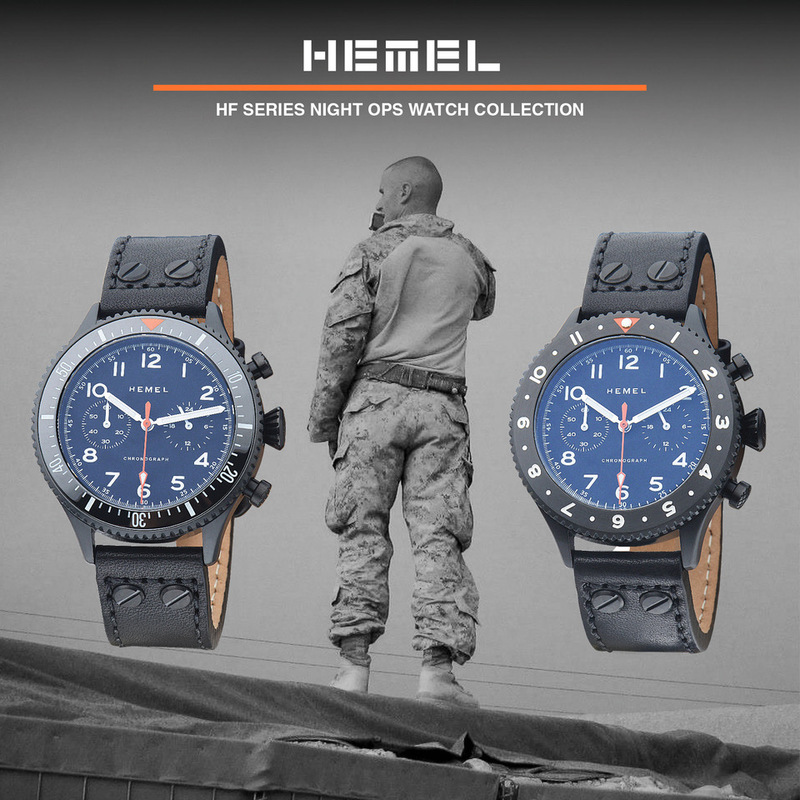 It also and ups the ante with a 100 meter water resistance rating. Both watches have flat, anti-reflective sapphire crystals up front. I wish it were domed, as that would have played well off the curves of the case. The standard Heritage has a sapphire display window in back while the Royal 300 has a solid case back with decorative stamping and an engraved serial number. The standard watch is certainly a nice piece at a nice price, but for less than a $10 difference, the bracelet and higher water resistance makes the Royal 300 hard to pass up. Whichever you choose, the motor will be the same Miyota 9015 automatic. Time Bum readers are no doubt already familiar with its specs: 24 jewels, unidirectional rotor, 28.8k bph beat rate, 42-hour power reserve. 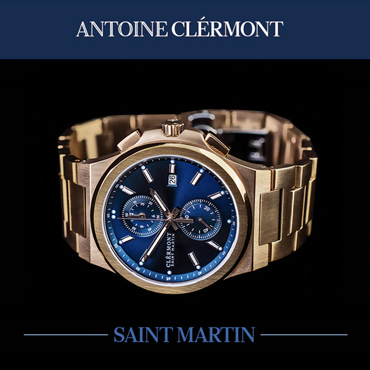 It is a smooth, reliable unit and while it is not highly decorated, the Rose Gold model does have a signed rotor. The Erroyl Heritage collection is a tempting proposition. 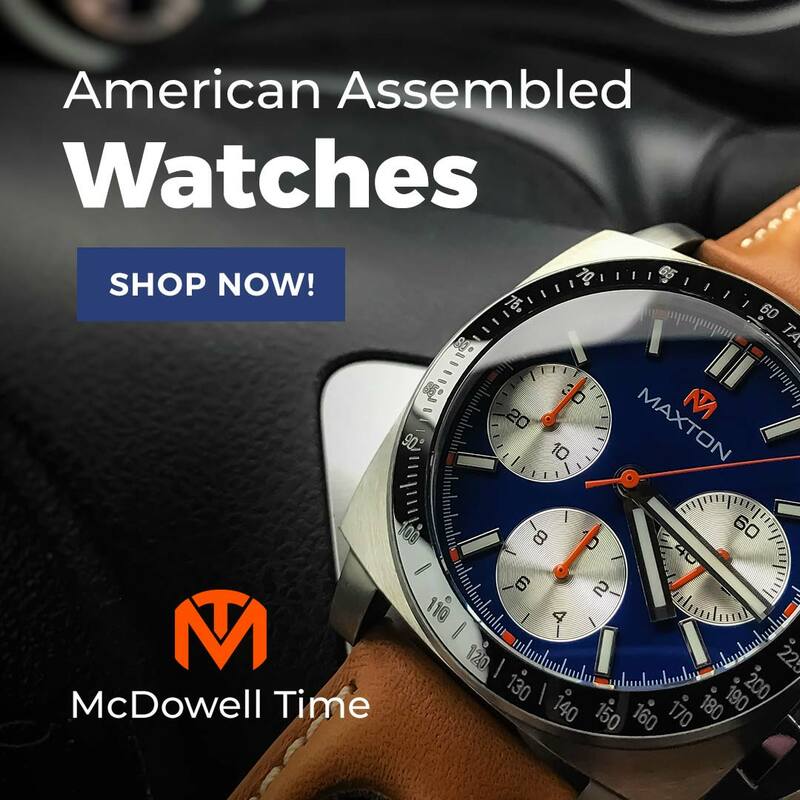 They got the details right, chose a quality movement and materials, and they are delivering it for an excellent price. 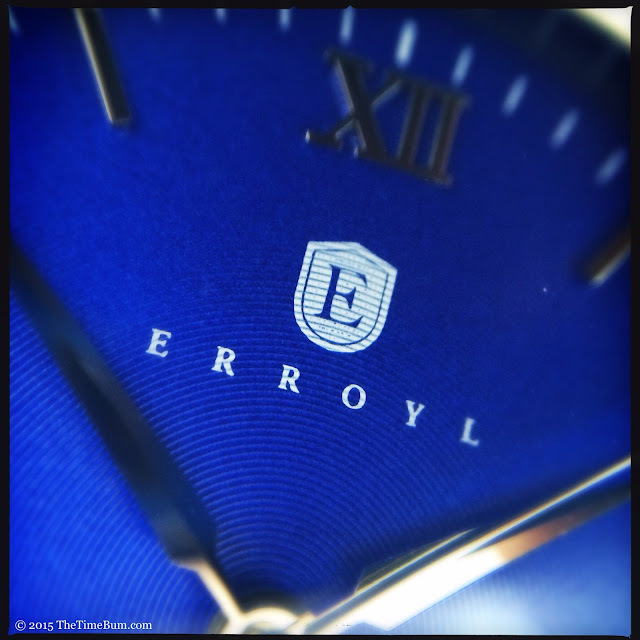 If you are in the market for a refined timepiece that you can take to the opera and still wear every day, you should give Erroyl a look. 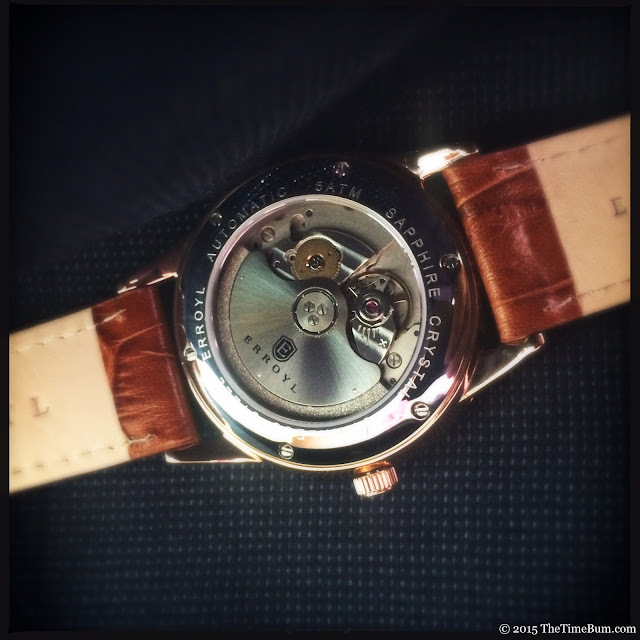 Con: One size too large for a classic dress watch. Sum: Affordable elegance achieved. The Time Bum approves.